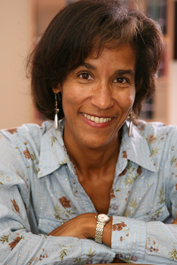 Maiya Williams has been writing and producing television shows for thirty years. The first black woman editor of the Harvard Lampoon, Maiya graduated with honors in History and Literature and immediately moved to Hollywood where she got a job on the short lived sitcom Charlie and Company. Her more well known credits include the live season of Roc, Fresh Prince of Bel Air, The Wayans Brothers, Mad-TV, The Wanda Sykes Show, Futurama, and most recently, The Haunted Hathaways.